Preheat your gas grill to medium-high (you charcoal Weber lovers are on your own). Take a store-bought pizza dough and cut it in half; roll it out thin (here’s a helpful hint: put your dough on a greased cookie sheet. You’ll want to put the cookie sheet directly on the grill to start, after a few minutes you can easily flip the dough over on the sheet. If you try to put it directly onto the grill itself, it will stick. Once you’ve put the dough on the cookie sheet, you can start to build your pizzas. 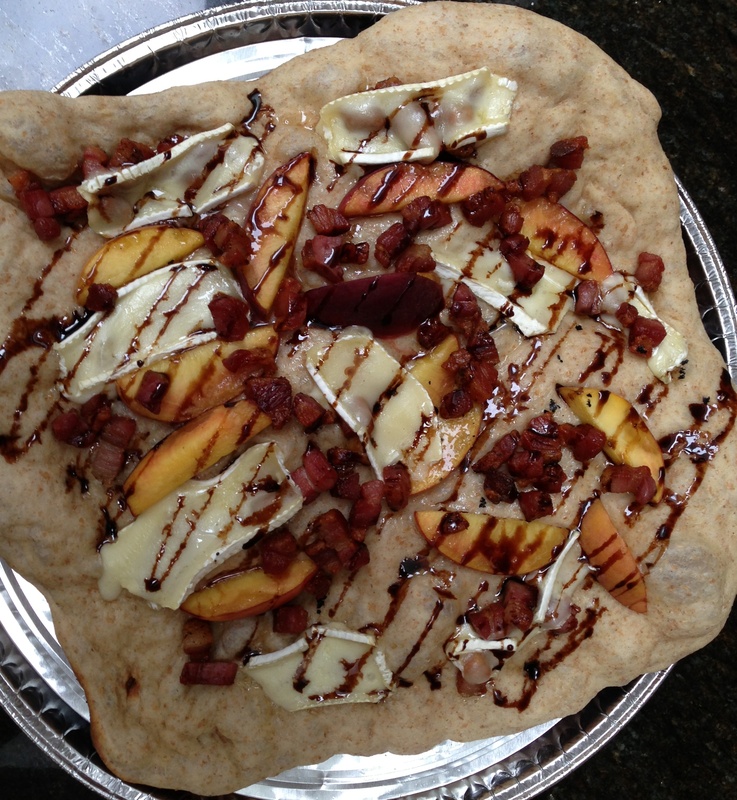 For the peach, brie and bacon pizza you’ll want to top the dough with sliced peaches and grill for about 10 minutes. Add the brie and grill until the cheese starts to melt—remove from the grill and sprinkle with the cooked pancetta (I swapped this in for bacon) and top it off with a balsamic glaze. One pizza down, one more to go. For the zucchini, goat cheese, and lemon pizza you’ll want to top the dough with zucchini (I’m not a fan of raw zucchini, so I sauteed mine first) and goat cheese, and grill for about ten minutes. Sprinkle with lemon zest and grill for another two minutes. Remove from the grill and top with salt, pepper, and some additional lemon zest. Voila! Two amazingly delicious grilled pizzas. Grilled pizza is in a category all its own. I fell in love the second I took a bite of both pizzas. The best thing is is that you can customize the toppings to anything you want (and there is virtually no clean up since you used a grill!). Try this recipe out, and let me know the creative toppings you chose. But until next time, keep eating! 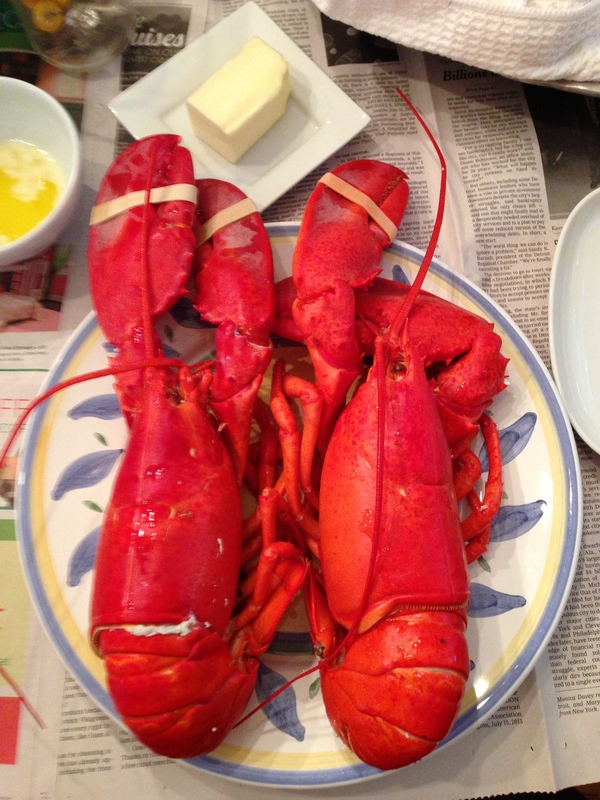 Fresh steamed lobsters? Check. Steamed Jersey corn on the cob? Check. Melted butter for dipping lobster into? Check. Fresh medley pie for dessert? Check. Put all those things together and what do you get? An absolutely delicious meal. I would eat lobster every day if I could BUT if you eat something every single day you’ll start to get sick of it and that would be devastating (it’s happened to some of my family and I’m certainly NOT taking any chances). This meal reminds me so much of Maine. My grandmother was from there and I have vivid memories of taking a road trip up there eating fresh lobster (literally having just been brought up from their traps in the sea) and picking fresh blueberries from a field. So when my mom suggested lobster the other night for dinner, needless to say I was on board. The fact that this meal is super easy too, is another bonus. All you need to do is buy however many lobsters you would like at your local grocery store (and they’ll even steam them for you which saves you a step). Once you have those, you’re all set to go. For the corn simply husk it and put it in a pot large enough so that when you cover them with water and turn the heat to high, they won’t boil over. Boil then for no longer than 10 minutes. Talk about fast. For the butter, take a stick (or two) and melt them in a measuring cup until creamy. Pour into a dish and voila, melted butter—need I say more? For the pie, if you’re a master chef and can whip up a fresh pie in no time, I commend you. As for me, I prefer to buy mine from a local market. Heat that up in the oven and serve! Throw some newspaper on your table for an authentic Maine feel (or for an easier cleanup) and dig in. It’s a messy meal—certainly NOT a good date food, I promise you. This makes for an awesome summer meal you must try! But until next time, keep eating!